In what I can only describe as an eerie yet appealing dimly-lit Baroque living room, the opening band by the name of Run River North took the stage at Hollywood’s Avalon, although “took” is a strong verb for their entrance. Needless to say I doubt that any member of the crowd had high hopes for their performance as the group, composed of six artsy looking Asians (who, as the lead singer pointed out, are not related) nervously shuffled into place. Lacking any semblance of showmanship, the band began to play in their stiff, deer-in-the-headlights manner, but after hearing them perform I sincerely hope that they make it big. What they lack in strong stage presence or overtly memorable charisma they make up for in pure talent and emotionally charged music, and although I was far from being alone in my initial skepticism I was thoroughly won over by the end of their set. Even though the lead singer was the only one who moved or spoke during the entire performance, the lack of flashy entertainment somehow made the group’s music that much more authentic. 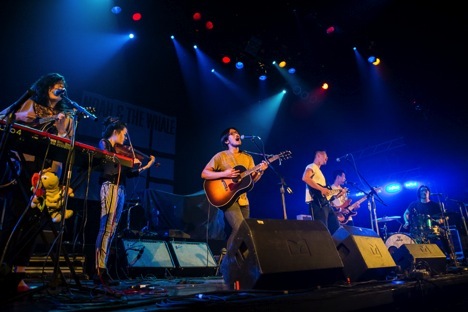 Unfortunately, Run River North (who, by the way, sound like a cross between Of Monsters and Men and the Lumineers) has yet to release an official album, but some of their songs can be found self-recorded on Itunes or Youtube. Fast-forward a half hour, a full crowd’s worth of people, and a lot of anticipation; que lights, music, and a few screaming diehards, and the headliners are taking the stage. Is it at all surprising that a posh British group with a debonair frontman, sing-a-long-able songs, hipster haircuts, and a distinctive indie folk-rock sound has gathered fans in the US? Hardly. 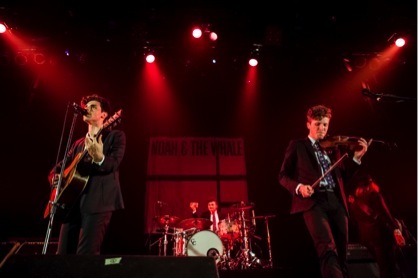 But after spending an hour and a half with Noah & the Whale I really can’t say that I blame them. I’ll admit that with the pleasant surprise of Run River North still fresh in my memory and little knowledge of the band’s music, I was was prepared to be unimpressed with its performance. Vocals: distinct but not the best I’ve heard. Stage presence: there, but not explicitly enthusiastic. Sound: good, but definitely not loud or lively enough to elicit any dancing from me. I had basically accepted it as I settled into what I believed would be a mediocre show. But after the second or third song, some invisible boundary was broken and all of a sudden everyone was having fun. The dim lighting was replaced by blues and reds, the band was moving and playing with noticeable energy, and the crowd was bobbing as people began to feel the music. With more than a few highlights, the show continued upwards for the remainder of the night. Tom Hobden on the violin was infinitely impressive and endearing, Michael Petulla on the drums looked like he was having the time of his life and played to match, and even though the bassist (Matt “Urby Whale” Owens) and guitarist (Fred Abbott) didn't attract much attention to themselves throughout the show, it was clear that they were an integral part of the band. And then there’s Charlie Fink. Without even having to try this young man is absolutely captivating, proper and gentlemanly in that way that I assume is only made possible by his Britishness. His quick wit and quiet, sincere nature paired with his unique voice, obvious passion, and piercing blue eyes made him the unrivaled center of the show, and as the band’s momentum picked up it became abundantly clear that not only is this group is one to watch not only for its talent, but also for Fink’s charisma. After an interesting but greatly enjoyable cover of Daft Punk’s “Digital Love” that got everyone pretty jazzed, a member of the audience felt the need to proclaim to the band that it was her birthday. What followed was one of the most memorable exchanges of the show; Fink playfully bantering with the crowd and ultimately dedicating the next song, “Blue Skies” to the birthday girl. I have to say that my favorite song of the night though, was one of Noah’s oldest releases called “Two Atoms in a Molecule”. As poppy and uplifting as it is brief, the song embodies the most elementary form of happiness that had everyone singing along and begging for more- which they got when the band broke into its most widely known and oldest single “5 Year’s Time” (if you haven’t heard it yet, do). Although the song would have been a perfect and upbeat way to end the set, the night took a more somber turn when the band chose to play “First Days of Spring” as its encore. With a suspicious amount of moisture in his eyes and a noticeable quiver in his voice, Fink kept the entire room spellbound with his tangible display of vulnerability. 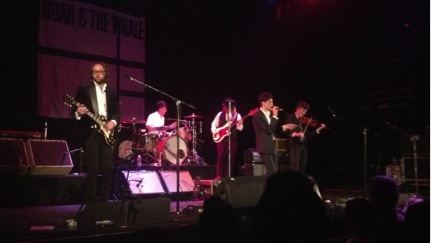 And that, friends, is how Noah and the Whale left the stage, ended the night, and stole a tiny piece of my heart.